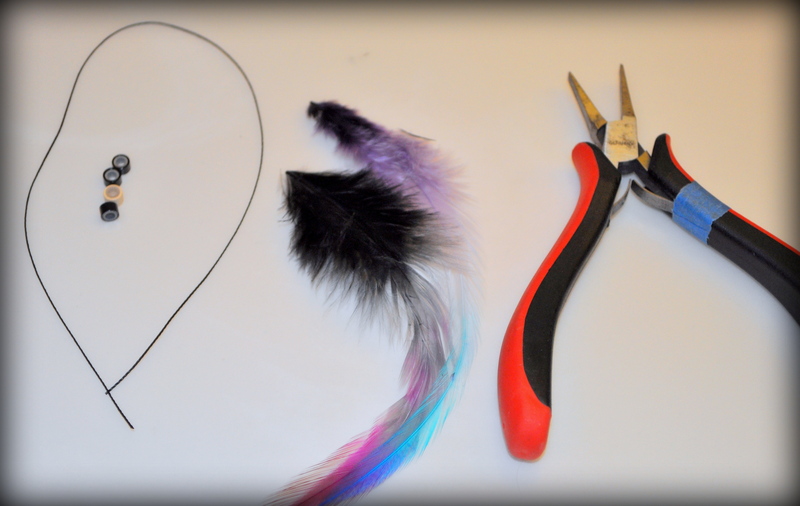 DIY Feather Hair Extensions – No Special Tools Required! 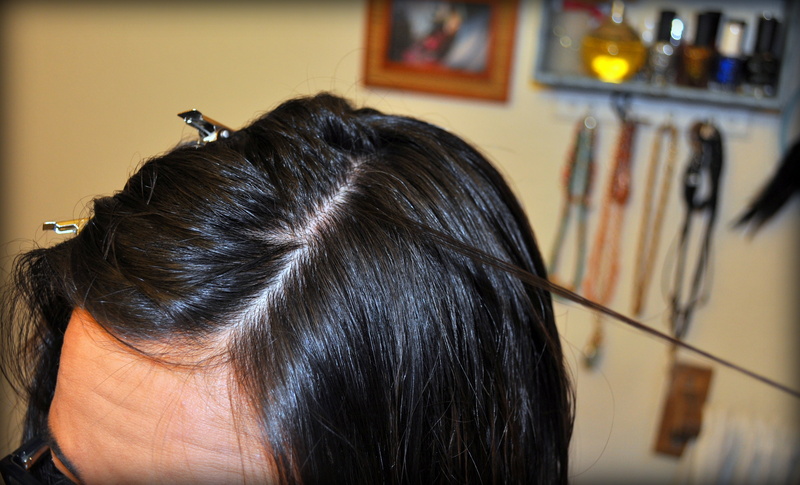 I’m going to teach you how to put feather extensions in your own hair. It’s so easy and so much less expensive than getting it done in a salon. All you need is a piece of string, silicone-lined crimp beads, some feathers and a pair of flat-nosed pliers. It’s also helpful if you have a comb and some hair clips to keep your hair out the way. 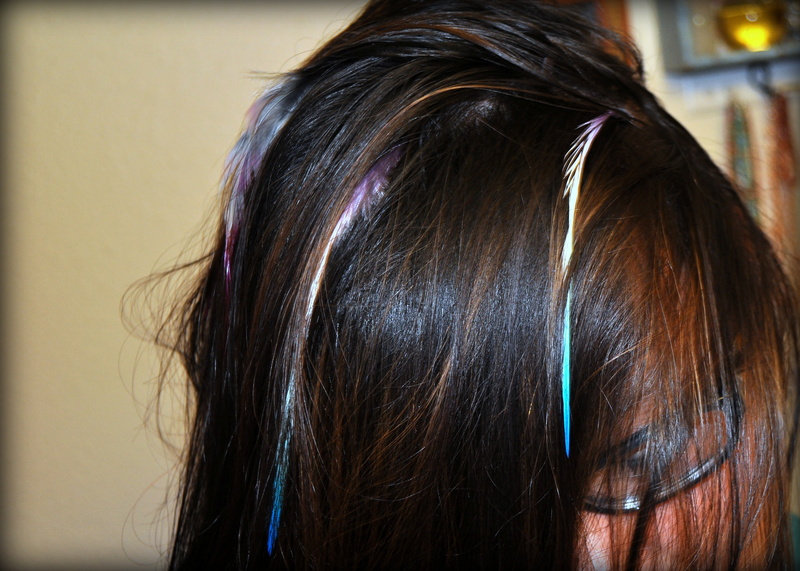 I took some pictures while I put a few feathers in my own hair to share with you. Here we go! Take your string and fold it in half. 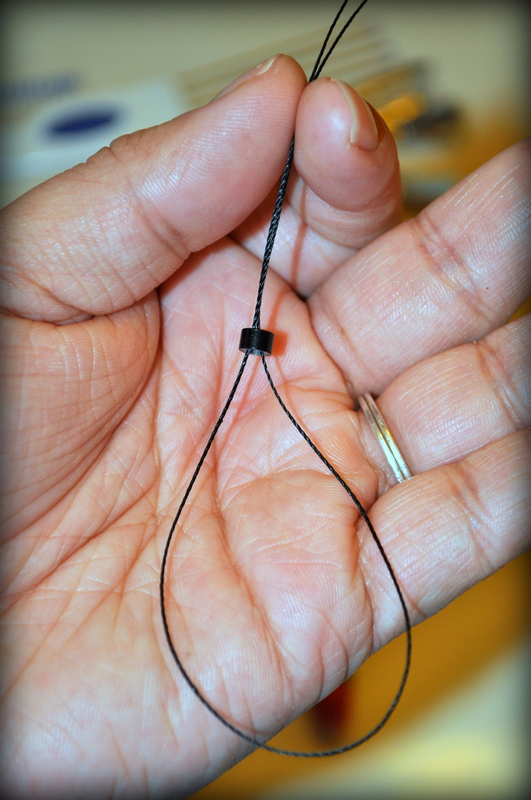 Thread your crimp bead onto the string and set aside. You should have a large loop at one end. 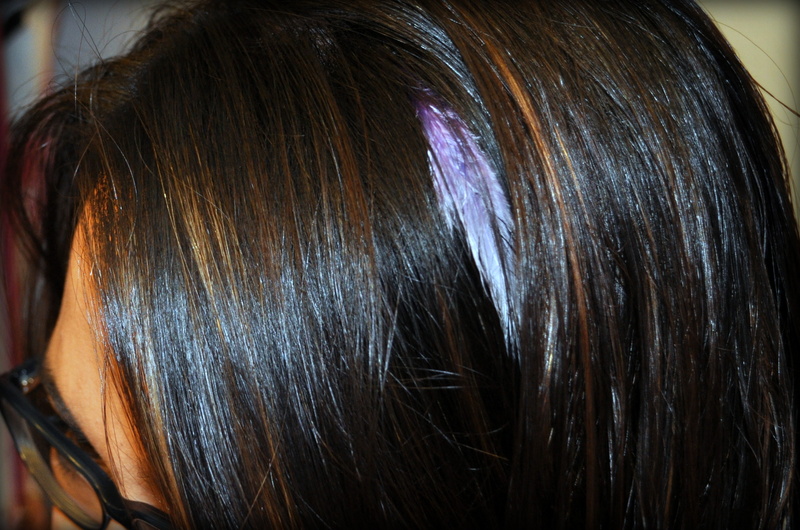 Decide where you want your feather and pin back your top layer of hair. You don’t want to put the extension right on the surface of your head because then you would see the crimp. 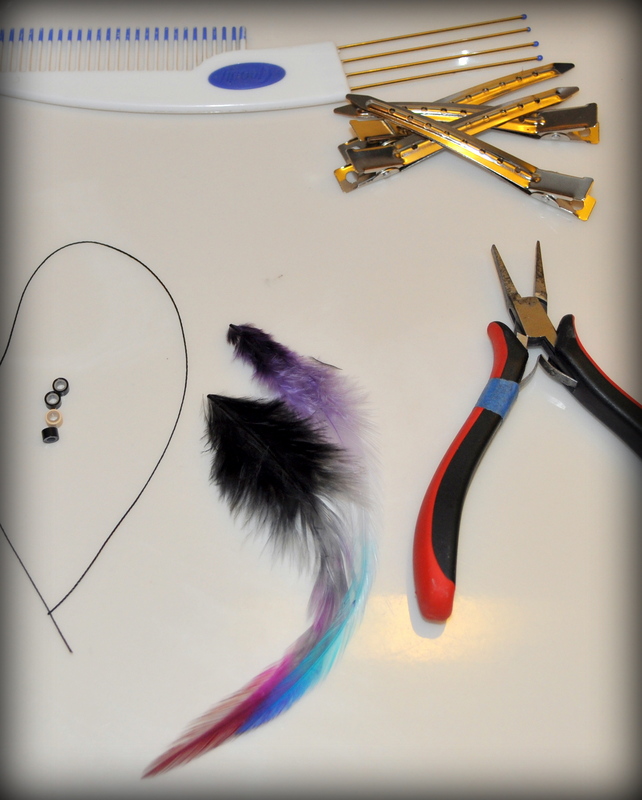 Next separate a small section of hair to anchor your feather to. Now thread your hair through the loop in your string. Slide the crimp down the string and pull your hair through the bead. 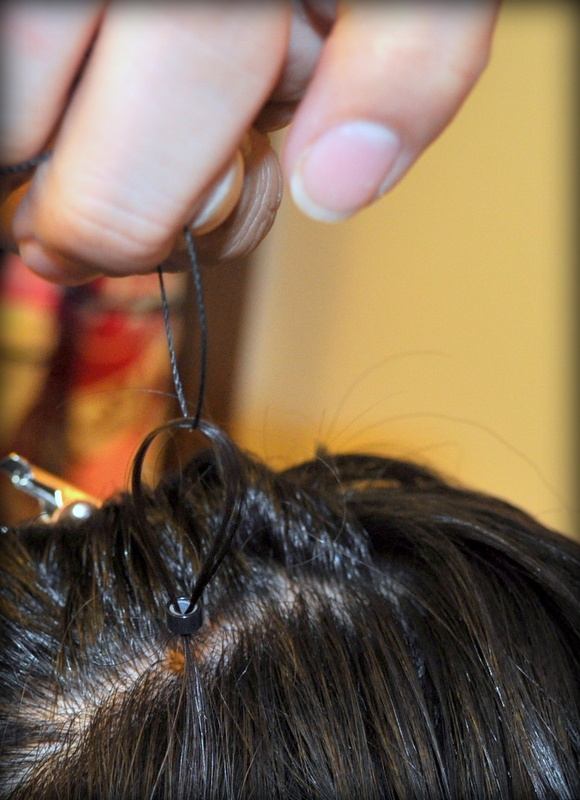 Position the bead near (but not right at the root) your scalp then slip the end of the feather into the crimp. Flatten the bead with your pliers. Feel free to add more than one (I have FOUR!) 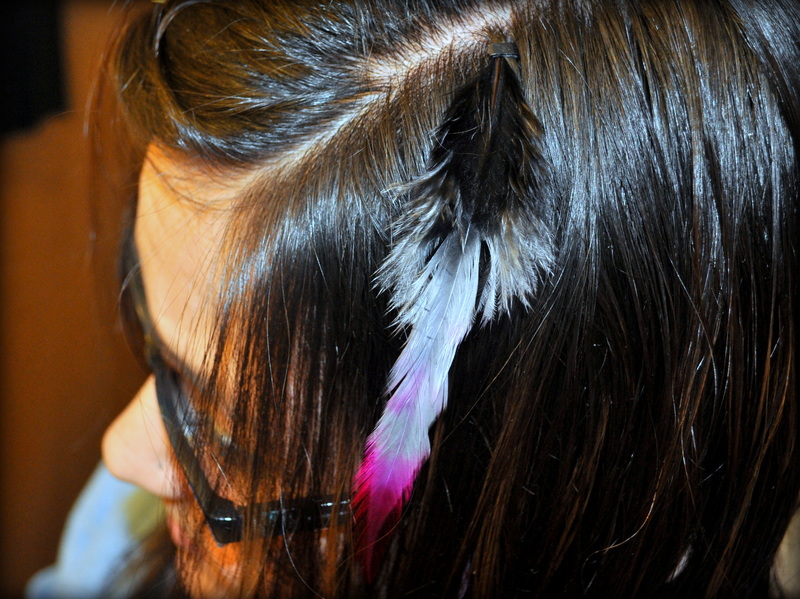 The feathers can stay in your hair about 4 weeks, until the hair grows out too much. To remove, you simply crimp the bead in the opposite direction. Because the crimp beads are silicon-lined they shouldn’t damage your hair. Then, style your hair normally! I like to hide mine so just a little color peeks out. You can’t see them all the time. It’s so easy to do that you can change them up as often as you like. I think this would be a fun activity for a girls birthday party, just buy a pack of the crimps and some feathers and you have enough for whole group of girls! I even put one in for my daughter. We even have synthetic hair extensions in several different colors if you are feeling really adventurous. THANK YOU…. THANK YOU… THANK YOU!!!!! The package come with no instructions. .and I have never seen it done. But the string thing is awesome!!!! I have blonde hair so with just 1or 2 the color gets lost (did I mention I have super thick hair too)….just gonna have to keep playing with them!!! Thanks again!! !